Sedona bed and breakfast travel guide for romantic, historic and adventure b&b's. Browse through the iLoveInns.com database of Sedona, Arizona bed and breakfasts and country inns to find detailed listings that include room rates, special deals and area activities. You can click on the 'check rates and availability' button to contact the innkeeper. In an area known for it's natural beauty, a stay at a Sedona, Arizona bed and breakfast promises to be a memorable experience. Take a step back in time at the Sedona Heritage Museum, a recreation of early pioneer life, or view the outdoor splendors of either Red Rock National Park or Oak Creek Canyon. Sedona, Arizona, is also famous for it's large community of artists, and no visit would be complete without touring the Tlaquepaque Arts and Crafts Village or the Sedona Arts Center. If a weekend of pampering is in order, be sure to check out the Sedona Day Spa. The mild climate, and year round activities of Sedona, Arizona have something to offer every visitor. 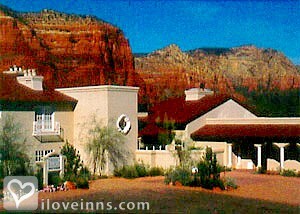 By Lodge at Sedona-A Luxury Bed and Breakfast Inn. Sedona is famous for its amazing display or red sandstone formations known as the Red Rocks of Sedona. From afar, these red rocks seem to glow when the sun sets and hits these rocks. The beauty of Sedona has caused it to be the site of a classic western Hollywood movie that was shot here. The 1950 movie Broken Arrow with James Stewart in the lead role was filmed here in Sedona, as well as Midnight Run with Robert de Niro, and an Elvis Presley movie, as well. 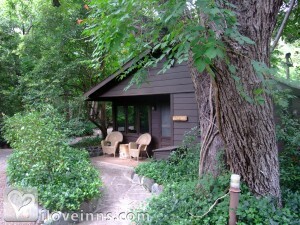 The first thing that you would want to do in Sedona is stay at one of the many Sedona bed and breakfast inns. From there set off to the many eco-friendly attractions in Sedona including mountain biking trails and fishing at the Oak Creek canyon. By A Sunset Chateau B&B Inn. What makes Sedona an ideal getaway is that it offers a lot of scenic spots to enjoy. Sedona gained prominence because it is where Cathedral Rock is located, a unique geological formation. The Sedona bed and breakfast inns ensure that guests can easily go to the city's points of interests. The Devil's Bridge Trail is a favorite of hikers who do not want too much challenge due to extremely rugged terrain. Oak Creek Canyon, which is only 6 miles away from the center of Sedona, offers crystal clear streams and amazing waterfalls. Seven Canyons and Oak Creek Country Club, on the other hand, are the preferred destinations of those would like to play golf. As beer lovers visit Oak Creek Brewery, art aficionados go to Bear Cloud Gallery to catch a view of the best artworks in the city. By A Sunset Chateau B&B Inn. There's something for everyone on a trip to Sedona -- whether it's an outdoor adventure in the scenic red rock canyons, or to simply relax and see the sights. Visitors can take a day trip to the Grand Canyon, go on one of the world renown hiking trails, take a jeep or wine tour, a hot air balloon ride, go golfing, do a day at a spa, go mountain biking, visit a state park, take in the museums and theatres and more! By El Portal Sedona Hotel. Unbelievable Views in Sedona AZ...Visions of Another planet By Lodge at Sedona-A Luxury Bed and Breakfast Inn.